Gold medallist in New Delhi in 2010 and more recently four years ago in Glasgow, Singapore’s Feng Tianwei, the top seed, suffered defeat at the semi-final stage of the Women’s Singles event at the Gold Coast 2018 Commonwealth Games on the morning of Saturday 14th April. She was beaten in a dramatic seven games contest decided by the very minimal two point by India’s Manika Batra (12-10, 5-11, 11-8, 5-11, 5-11, 11-9, 13-11). At the end of the fifth game it appeared Feng Tianwei had asserted control and that it would be only a matter of time before she secured victory. 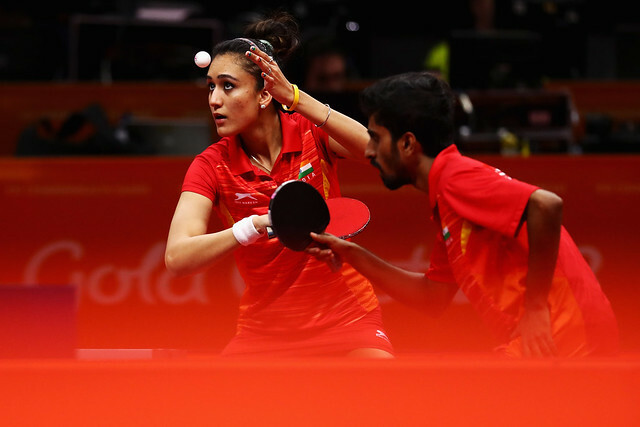 Manika Batra had other ideas, in the vital seventh game at 10-9 she held match point; then drama, the crowd gasped, ready to stand and salute the Indian but then reality. A forehand top spin from Feng Tianwei clipped the very edge of the table; one less coat of paint and it would have missed. Matters level at 10-all, Feng Tianwei won the next point, determined, Manika Batra won the next three points; Indian supporters leapt to their feet in hysterics. Defeat for Singapore but in the immediately ensuing contest it was success for the south east Asia city state; Yu Mengyu, the no.3 seed, beat Canada’s Zhang Mo, the no.2 seed, in five games (11-7, 11-8, 9-11, 11-8, 11-5) the consistent top spin play of the Singaporean they key to victory. The bronze medal match is scheduled for later in the day at 6.10 pm, the gold medal contest follows at 7.00 pm.